The vertebral disc is a strong ligament that acts as a shock absorder between the vertebraes in the spinal column. When an absorbent amount of force is applied to the spine, the discs can rupture and cause pain. This is commonly known as a herniated disc or “slipped disc.” Lumbar and cervical herniated discs can irritate nearby nerves and cause radiating pain down the arms or legs (sciatica). As individuals get older, they become more susceptible to disc problems like degenerative disc disease and disc herniation. 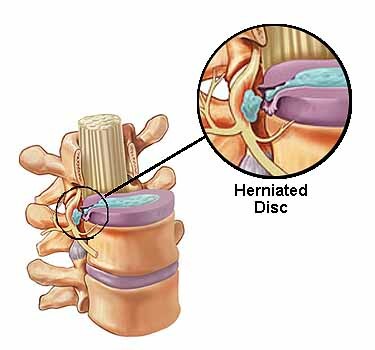 Even if individuals do not suffer from a herniated disc, they can feel pain from a torn disc. If not treated, an individuals suffering from a torn disc may be prone to future injuries. Common Symptoms: Back pain, radiating arm or leg pain, and unusual sensation (numbness, tingling, burning, aching, sharp). Chiropractic care is an excellent conservative care (non-surgical) option for preventing and treating pain associated to herniated discs. Depending on the outcome of the consultation and physical exam, your chiropractor will determine your treatement plan, which may include manual therapy and therapeutic exercises. At Chiropractic Concept, we recommend spinal adjustments, traction/decompression treatments, soft tissue therapy, and exercise training. In addition to treatment, our chiropractors educate our patients on good body mechanics, which helps to prevent excessive wear and tear on the discs. If you’re experiencing any pain or discomfort, please don’t hesitate to call our office for an appointment.